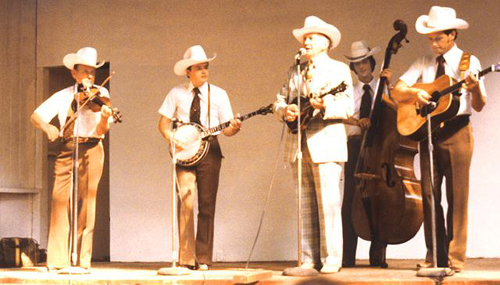 I met Wayne when he came to San Francisco in the 1970's with Bill Monroe and the Bluegrass Boys. one could tell after hanging out with these two for awhile. Like the time in Berkeley that Bill wanted to play "My Last Days On Earth". you send Jim Moss to get the mandolin? This was his specially tuned mandolin, remember. Bill said, "No, I don't want David (Grisman) to get the tuning". As if, right? Or the time that Bill had just broken up with Julia and I came up and asked Bill, "How's Julia?".
" He is just getting over her", "Now he is going to be depressed again", "We have to live with him". Now, I could understand being depressed, Julia was a bombshell. sub-groups. I can hear Wayne's voice now, "Baker... What are we going to do about..." and so on. I don't care. Bluegrass musicians will always have friends, fun and never really grow old. well mannered fashion, not unlike Jack Hicks. Well, on with the interview. as we recalled them. So, to give some sense of the mood, I included some the laughs. JIM MOSS: Is this his ownself? WAYNE LEWIS: Jim Moss, how are you doing. JIM MOSS: Tell me about that time Frank came on stage with you guys, Monroe and all. WAYNE LEWIS: You know that happened back in... in 1984. JIM MOSS: 1984? Where was this at? WAYNE LEWIS: It was at Mount Gilead Ohio. and uh, Bill... Bill told him... he said uh, and Frank was booked there at the festival. On my show, you'll have to come up and do a number with us. JIM MOSS: Did he do just one number? than Bill did... and Bill told him, "That's really good", "That's really good pickin there". the star bit on it. And uh.. Frank said, "Man that's bad man, that's really bad". So when Monroe hit that last lick on the tune, the crowd was just ripping and roaring. and he said, "Man that's bad man, that's really bad"
And Monroe just kind of looked at him with that look like... "What are you saying?" Bill says, "What do you mean bad? You don't know what you are saying". Frank said, "Bill I'm just backing talkwards". Bill said, "You're talkin crazy what You're doing"
Man that is just one of those good stories, you know. JIM MOSS: Did he ever talk to him again? he says Good Bye?" ha ha ha (Monroe) That's crazy too! JIM MOSS: So who was in your band at the time? if Tater was playing fiddle or if he was playing bass. Blake was in the band. JIM MOSS: So you guys were laughing? JIM MOSS: So did Monroe understand he was joking? WAYNE LEWIS: I don't think he ever did. Monroe finally quit talking to him on the stage. JIM MOSS: Did he really? Oh they were dying of laughter... you know. Cause Monroe was ready to hang him. One of the great moments, you know? And both class acts, I mean quality musicians. to San Francisco. And you found your bus driver in one of the gay bars near the Music Hall? The music hall was in that kind of district, you will remember. In fact, there was nothing but girls here, except for one guy off at the other end of the bar. service jacket with an bright eagle on it. They all thought he was from the vice squad or something. JIM MOSS: I have a tape of that show. I wanted to go get a drink. And the guy said, "well there's a bar just around the corner down there". WAYNE LEWIS: Yeah right, not your average, everyday hillbilly bar. kind of a rough district, you know. WAYNE LEWIS: Oh I know..
JIM MOSS: That was right next door to the Mitchell Brothers Theater. WAYNE LEWIS: We couldn't get Baker to go out and loaf much after that. Just kept our own drinks, kept them on the bus. get whiskey, and hide it on the bus. WAYNE LEWIS: Yeah.. ha ha ha Oh.. we had some great times. I guess they were good times. Some of them I can't remember. and Joe... Joe Stuart. For awhile Joe traveled with us and we had twin fiddles. that he would admit that I did, was "take a sip of whiskey". JIM MOSS: Right... Well Monroe hated anything that was fermented. WAYNE LEWIS: Yeah, and he hated beer. WAYNE LEWIS: Yeah. See he told me. Bill told me one time..
that ever lived". And uh.. he told me that on numerous occasions. WAYNE LEWIS: He hated beer. He called beer slop. JIM MOSS: He wouldn't eat butter, that is what he called butter too, slop. WAYNE LEWIS: Oh, I know, he wouldn't drink milk. He would say, "you don't drink that old beer, do you?" I'd say "No sir, I don't drink beer"
He said, "that looks just like where a horse has been". no, I mean a fiddle player. What? I think you had them phone ahead as I heard it. Someone from the band had made a call to the music hall and I got a call from them. You, Baker and Monroe were the only ones I knew at that time in that band. when everyone was coming to see Baker. auditioning me to go to Japan. collar bone and it bothered him. He said, "Go ahead" and handed me his fiddle. I don't know what happened to him later on, did he have it numbed up or something? hired a bass player in Japan and made Tater play. WAYNE LEWIS: It would have been a heck of a job. It would have been a good one. I wanted to go. He was pretty positive about the whole thing. but... listen to this.. I mean talking about Monroe and Baker, and at that point in time.. ha ha. of Paddy on the Turnpike from Bill. version that Baker would put out, and it seemed like he would never run out of variations. how many versions he knows!" So I just let him keep playing. He would ask me, "Is that it?".. no no.. keep going. then "Is that it?". what you are looking for", he said and walked into his kitchen. turned to me and said quite loudly, "That ain't the way that tunes goes! ", "where did you learn that?". I said, 'Well, I learned it from Kenny Baker". Man, that was the wrong thing to say. Baker had just quit the band a few days earlier and Monroe was still upset. "That ain't the way that tunes goes! ", he said, "That is the way a drunk plays it!". "The things that person can say, only a drunk would say that. A man should be ashamed... "
I sensed I was on thin ice there, so I quickly moved on to another tune... and Bill cooled down. it to happen, but I was glad that it did. I am glad that they made peace with each other. JIM MOSS: Yeah, well it was sort of like the Beatles fighting. Those two guys... were pretty tight. WAYNE LEWIS: Yeah. Yeah, at one time they was. JIM MOSS: They raised chickens or something. WAYNE LEWIS: Yeah, they raised those chickens and fought em. family is from Tennessee... around Oakridge... And actually, my cousins had a chicken ranch. I had seen some pretty gross things done to chickens as they butchered them, but not that. at one time though. So I guess it could have been just a story to impress the city kid. I mean, a red chicken to me is a red chicken. It was in 1974. I don't think you were in the band yet. Dwight Dillman was in the band. play around, or something, you know. and you could hear him say, "Ahh, Man!". ha ha And I am out there with a camera, right? by his side of his waist... his hip... and he flips Monroe off. Kind of on the sly you know. this picture. I asked him if I should post it on the web and he said, "Well go ahead!, you should!" ha ha ha. Well, I think that is one for the archives. WAYNE LEWIS: Baker definitely didn't care. WAYNE LEWIS: Baker's a pretty rugged old dude. JIM MOSS: He's pretty cool though. WAYNE LEWIS: Yeah he is. JIM MOSS: Yeah, he is difficult sometimes.. but he's pretty cool. argued. We would get drunk and party and get out there and sworp around them festival grounds. And never once did we argue. It was just what happened to Frank you know. JIM MOSS: And you could just say something and he (Baker) would just turn purple! you know? that you could end up... I mean, when I was in Bean Blossom in 1973, I was lucky I didn't get killed! said something like... There was this guy who played fiddle there that hung around with Bill a lot. in the daytime. I didn't sleep for 3 days, I remember I was high on coffee and biscuits and gravy..
something else and someone started chanting "Shoot that turkey buzzard". I was totally clue less. JIM MOSS: How old are you? in Ohio. I was working a club circuit... but I .. I was still a hillbilly at heart, you know. JIM MOSS: Well, what kind of music were you playing? Bluegrass music, I worked all those. Then.. at the Astro Inn, in Columbus Ohio, I worked that 6 years. I worked a 3 year stretch, then I took and worked another club, then I came back and worked 3 more. JIM MOSS: So you would play one club all the time. WAYNE LEWIS: Yeah, I would play 6 nights in one club. school auditorium... Maybe uh.. Maybe Monroe would be coming through. on the weekends. Because just about every weekend we had a big name in, Reno..
JIM MOSS: Uh huh.. How did that work by the way? As far as pay goes? WAYNE LEWIS: Yeah, Yeah, I got paid a certain amount every night. at the door and that is what he would pay Monroe, is a percentage of what came through the door. there I made $30 a night and my band members made $20. JIM MOSS: That was probably pretty good back then. WAYNE LEWIS: Oh it was. That was good money. WAYNE LEWIS: You take 6 nights a week that's $120 bucks, that's a pretty good chunk of change. you pay for a house to rent? WAYNE LEWIS: Oh... $75 $75 a month. For maybe a big nice, real nice home would be $100. $105. JIM MOSS: So you were making 4 to 5 times your rent. WAYNE LEWIS: oh ...yeah. And of course I worked in a steel mill too during the day. JIM MOSS: That's right, you use to do air conditioning when you were in the Bluegrass Boys. I bought a dump truck and bulldozer and played music on the road and still have a construction company. from the Jim Moss 1983 Bluegrass Fiddle album "Through The Windshield"